Spend a day in Battery Park City and you'll almost forget you're in Manhattan. It’s hard to believe that some 50 blocks south of midtown’s sensory overload lies a small enclave with more than 30 acres of parks, a mile-long waterside esplanade and a surfeit of green apartment buildings. Located along West Street near the Financial District, BPC is graced with old-fashioned streetlamps and dazzling water views at every turn. It’s no wonder there’s so much to do there with kids; the area is the semi-new hot spot for apartment-dwelling families. Grab your shades and a bottle of sunblock—you’ll need it—and head downtown (subway lines including the A, C, E, R, W, 1, 2 and 3 service the area). At Nelson A. Rockefeller Park, children can ride the pedal-powered merry-go-round and scope out tiny bronze creatures in the sculpture garden. South Meadow is a prime picnic spot; after lunch, toss a ball in the grass. Visit the Skyscraper Museum (39 Battery Pl at West St, 212-968-1961) where kids can learn about the history of tall buildings. 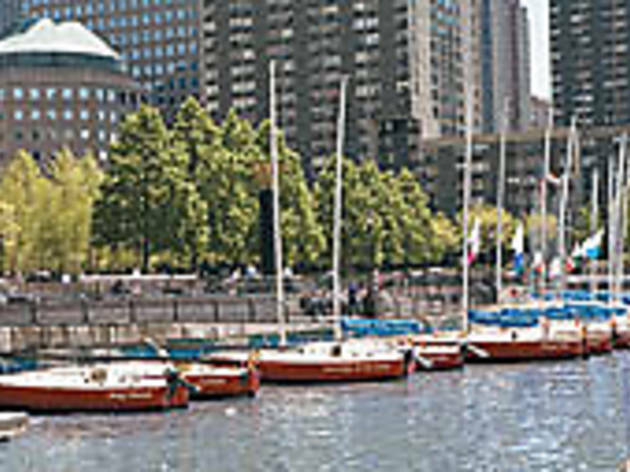 The Battery Park City Parks Conservancy (bpcparks.org) also hosts child-tailored programs throughout the summer. Tiny ones can sit on blankets to hear storytellers Elvira and Hortencia Colorado read the Mexican legend “Holding Up the Sky” in Rector Park on Saturday, July 14, at 11am. Order your tykes a “Coyote Dog” (a hot dog wrapped in a flour tortilla with pico de gallo and melted cheese) at SouthWestNY (2 World Financial Center at Vesey St, 212-945-0528). 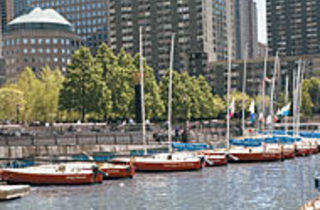 Request a table outside; the eatery offers fabulous views of North Cove harbor. If your family’s craving dessert, try Italian-style cinnamon caramel swirl ice cream at Ciao Bello Gelato (2 World Financial Center at Liberty St, 212-786-4707) or yummy eclairs ($3.25) at Financier Patisserie (3--4World Financial Center at Liberty St, 212-786-3220). At Boomerang Toys (2 World Financial Center at Liberty St, 212-786-3001), kids can purchase Schleich animal figurines and Crocodile Creek hand-painted music recorders; they can also try out the Thomas the Tank Engine train table. Aminah et les Amis (2 World Financial Center at Liberty St, 212-227-0117) sells high-end children’s clothes from companies like Ashor’s Room, IKKS and Petit Bateau . 11am--12:30pm Stroll along the esplanade. See how many works of art your family can find (there are 20 in all). Our favorite is Rector Gate, a 1950s-style steel archway. 12:30--1:30pm Take a break for empanadas at Pan Latin Caf (400 Chambers St at River Terr and Rockefeller Park, 212-571-3860). 1:30--2:30pm Head over to Teardrop Park, between Warren and Murray Streets. Kids can “rock hop” and try out the jumbo slide. 2:30--3:30pm Stop at the New Manhattan Youth Art Shack on the Hudson River, just north of Chambers Street. Paint a picture as part of the free art program. 3:30--4pm If you need a breather from the heat, jump on the Downtown Alliance free bus. It makes stops throughout BPC. 4--5:30pm Take in the view of the Statue of Liberty during dinner at Gigino’s at Wagner Park (20 Battery Pl at West St, 212-528-2228). Kid fare includes pizza panne: baked bread with tomato and mozzarella ($8.50).